You plan to go for a ride in Bali by bike ? Here's my feedback with several possible routes and the best things to do and see. 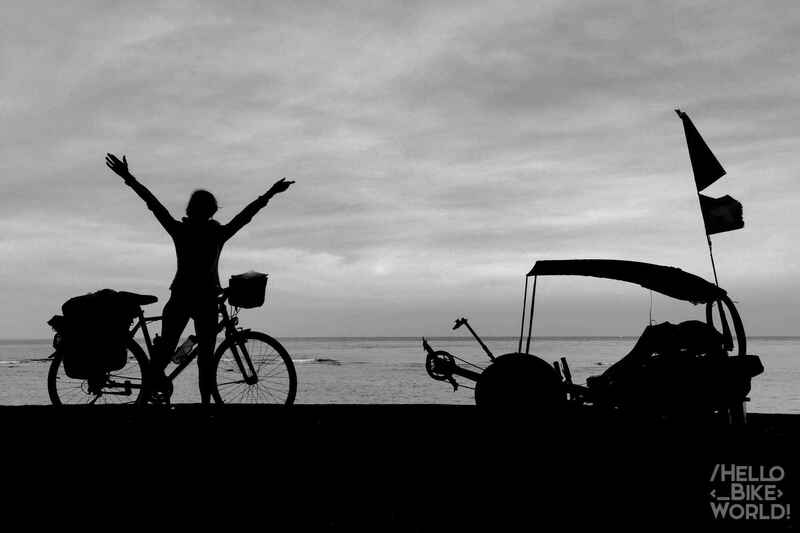 Bali is a fantastic island to explore by bike. The routes are varied, there is always something to watch, people salute. We're not bored ! easily found water in restaurants (there is a service of large cans of water = braid), or in many supermarkets Indomaret and Alfamart. It is VERY easy to eat, whether in “real” restaurants in tourist towns, small-Bouis Bouis or stalls at the roadside. You can eat royally for 2$. For toilets, it is sometimes difficult to find a wild corner with nobody around, but almost all restaurants have restrooms (sometimes a hole in the back of the house) and all Alfamart and have Indomaret ! The premises are always kind and encouraging to cyclists. They really appreciate the fact that we go at our own pace to discover their country, not just in tourist Kuta or Ubud cocoons. Bali also is good for the wallet. Although it is difficult to put the tent over, there is always a great bed and breakfast for less 15$ ! The roads are very steep and it will be sure to have the appropriate group on his bike to climb. Some roads are busy and some drivers are careless to overcome. Do not hesitate to win and get to the middle of the road to avoid being overtaken anyhow ! It's hot ! I always carried about 3L of water on my bike that I filled almost 2 times a day. Caution also sunstroke. It is difficult to find places to put the tent. When there are no houses or forest, there is a paddy field or wetland. Can anyway to go unnoticed. It will anyway ask permission to local when possible. It was never thrown. It was the one time de-camp because we put our tent under a shelter which had a religious character. They very kindly asked us to leave but we immediately helped us find a great place ! After spending more than two months on Java, Bali and Lombok and walked many roads, Here the map the route that I conducted with the important points. I rode with my brother first Java, then with my parents in Bali, and Sarah in Bali and Lombok. The map that I created includes all trips to places of interest in Java, Bali et Lombok. After taking the ferry to Gilimanuk Banyuwngi, we slept in the park at the arrival of the ferry. The night has been rather quiet if we forget the ads from the speaker from the ferry terminal. The next morning, we follow the northern route up Bubunan. Although this is the only North Road Bali, it is not busy and is quite pleasant to ride. The southern route is the main axis that leads to Denpasar, thus avoid. The suite was even more steep ! At the Falls, there was no one, or even a real car. We leave the bikes there, unattended and go down to the falls. In just 10 minutes, we reach the waterfalls and we bathe there. The place is beautiful and worth seeing clearly (and exhausting mounted). There is also a small restaurant to perk. The rest of the climb becomes much simpler, thanks to the small improvised swimming. 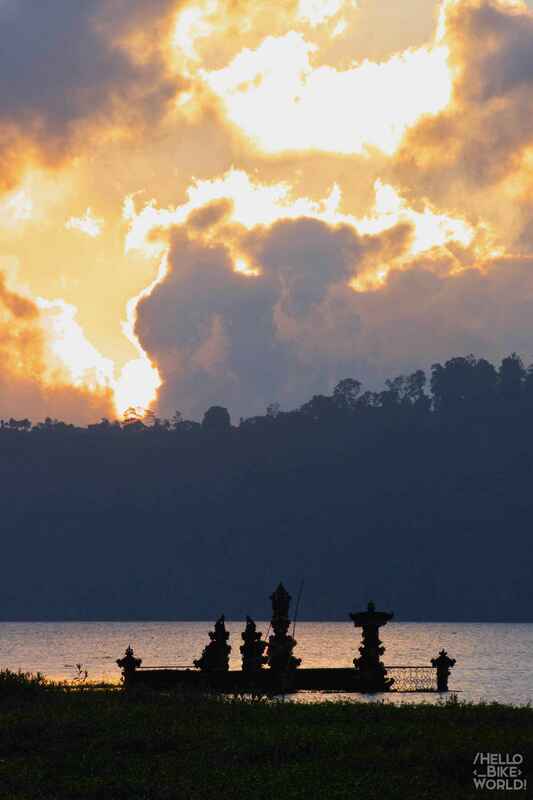 1400m d’altitude, that's it, it dominates the surrounding area and Lake Tambingan. The road looks suspiciously like a small Swiss Pass road on the ridge. orange merchants are crossed, delicious and many attractions for tourists where you can take pictures on huge swings with a view of the second lake, le lac Buyan. At the crossroads of Wana Giri, this is the perfect place to perk up with fruit or bakso, but watch out for monkeys ! The road down to the foot of the lake is called monkey street, and this may be the place of the island where monkeys are the most numerous and most scroungers ! If by mistake, you are away from your business, in a few seconds, a raid organized monkeys subtilisera your food ! The monkeys even know how the pockets Velcro or zippers. 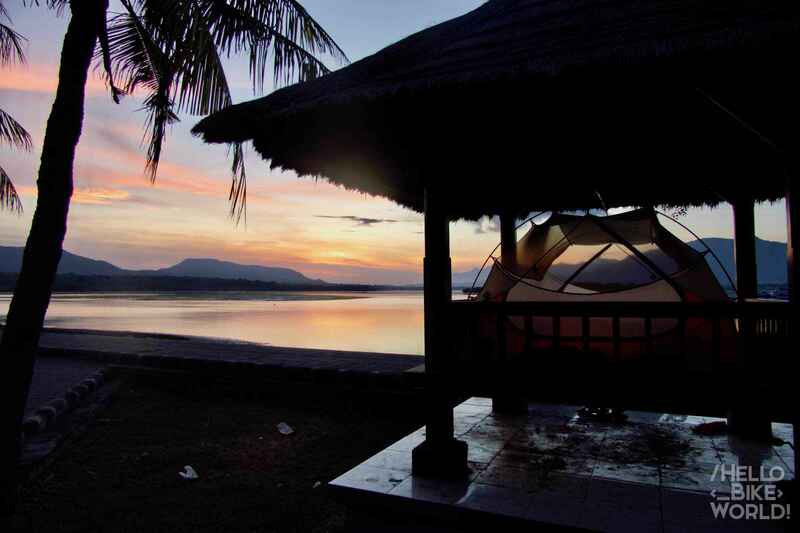 After the hard day cycling, what joy to watch the sunset at the lake, tent placed in a new small campsites around the lake Buyan. At the end of the road, there is even a Free camping. For 20K R / pers, we decide to go in a camping with toilet block, showers and a shelter to put the tent in case of rain. There is even a small cafe close to where it is possible to ask for something to eat. 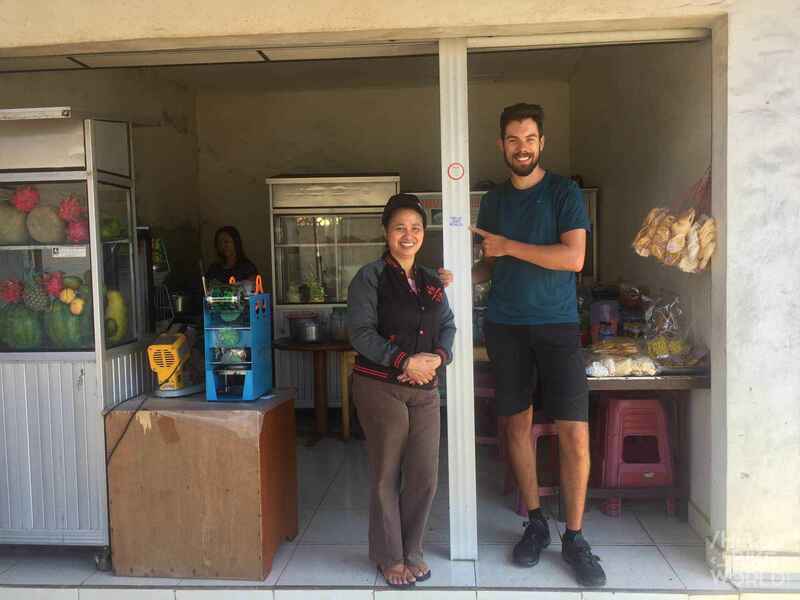 The next morning, we'll see Made his little warung. There is a table, and you feel like royalty ! Fresh fruit juice and nasi pecel are in the game. After enjoying the tray and 3 lacs, it is time to go down to the south of the island. Two choices : the main road, fast and direct to Denpasar, or a country road, roller coaster, but through one of the most beautiful places on the island : the terraces of Jatiluwih rice fields, Heritage of Unesco yes yes ! You would have understood it, the second choice is more tiring but worth the climbs and descents incessant. The road is beautiful, through small villages, woodland and raw rice. And suddenly, THE view you, two fully furnished terraces slopes. Small paths allow to walk through. When you meet all the restaurants and mini tourist bus, no doubt, you'll know you've arrived ! Yes, the famous temple. You must love mass tourism again. I think we were lucky because the temple was not at all crowded as we thought. 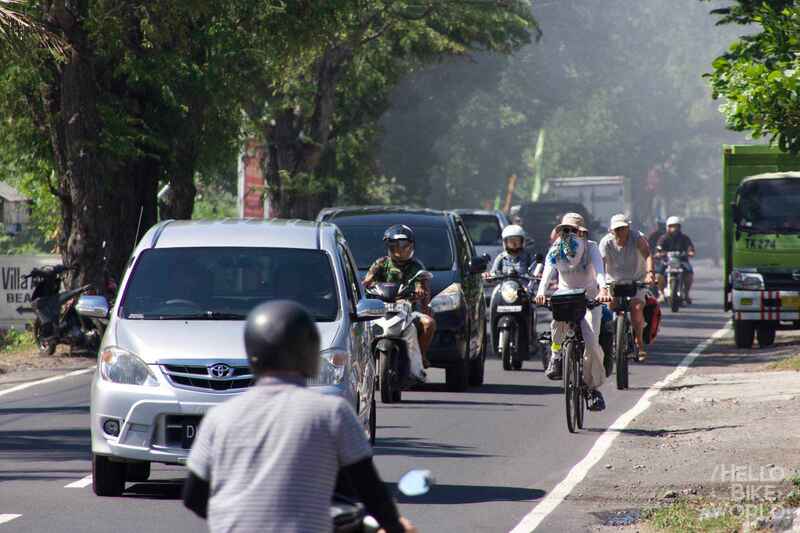 By bike, it is easily accessible and always downhill when it comes Jatiluwih ! Kuta is not for you ? I understand, for me either. A second zone develops periphery : Canggu. 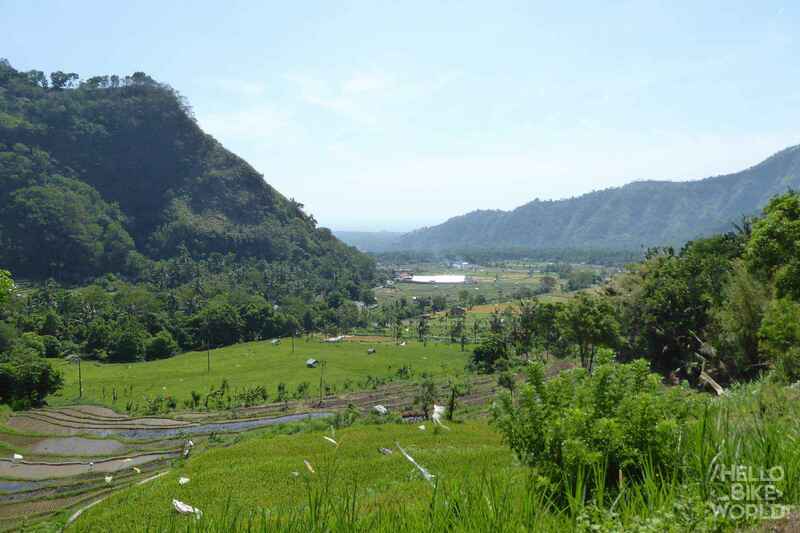 In the middle of the countryside emerges many restaurants and surf clubs next to the beautiful beach of Batu Palong. The road is not very nice by cons, because it is quite narrow and crowded at peak hours. This is a must for the beach. We put the bikes two lovely guesthouses somewhat remote inland : Ryan Bagus Guesthouse and Cempaka Mas Guesthouse. Passing Kuta, it falls on the worst mass tourism but obviously some nice restaurants and cafes. The Kuta Beach is a beautiful beach lying several kilometers where you can take surf lessons. There are many small hotels and inns to Kuta. Our favorites were Celebbest for its pancakes will and backpackers atmosphere quite pleasant and City Garden Bali his court, its tranquility and the opportunity to ask the bike just before the Chamber. airport when we were there was a little work and we were denied access barriers… I do not think the guard has understood that we were going to fly with bikes. Anyway, we had to respect the wacky orders and tour, drive under a gate even after spending a few long minutes to convince two or three types to let us pass. You would have understood it, it's not very common to fly with the bikes and even less common arriving by bicycle to the airport. 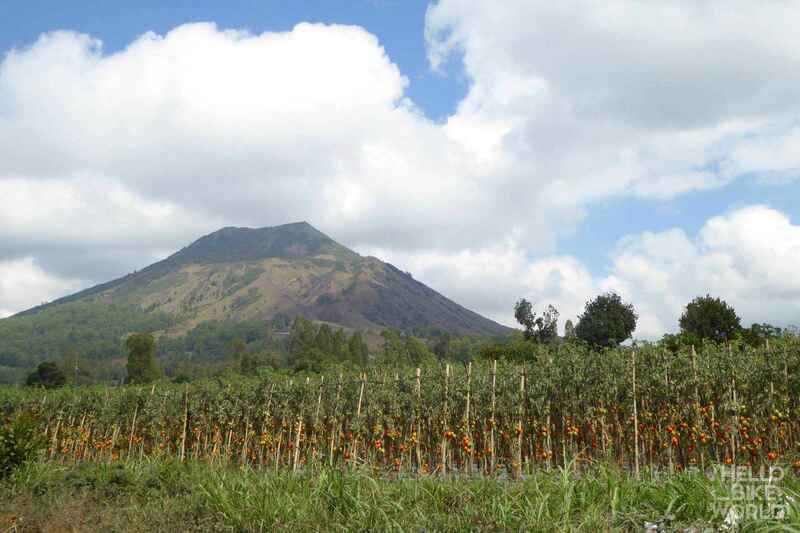 Skip north of Denpasar Seminyak by then head of Ubud – Some roads to take charge but finds herself in the countryside. 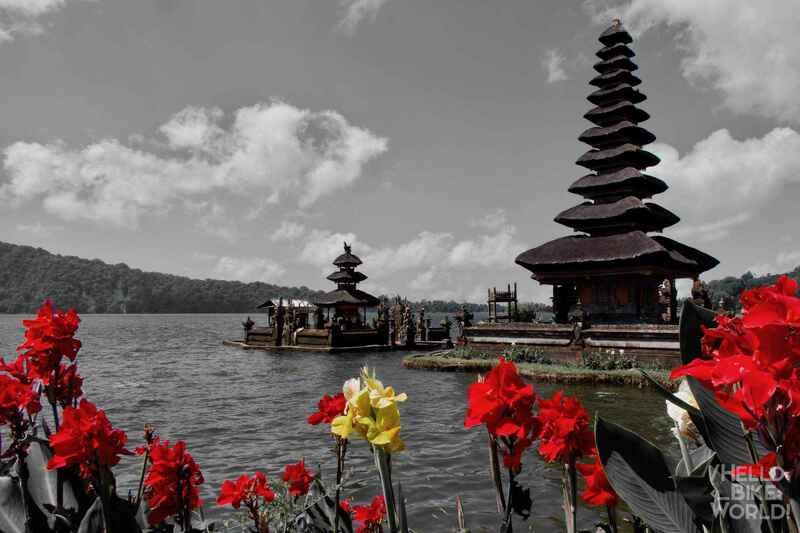 Get through Denpasar – Many city, traffic but fast enough to leave town. 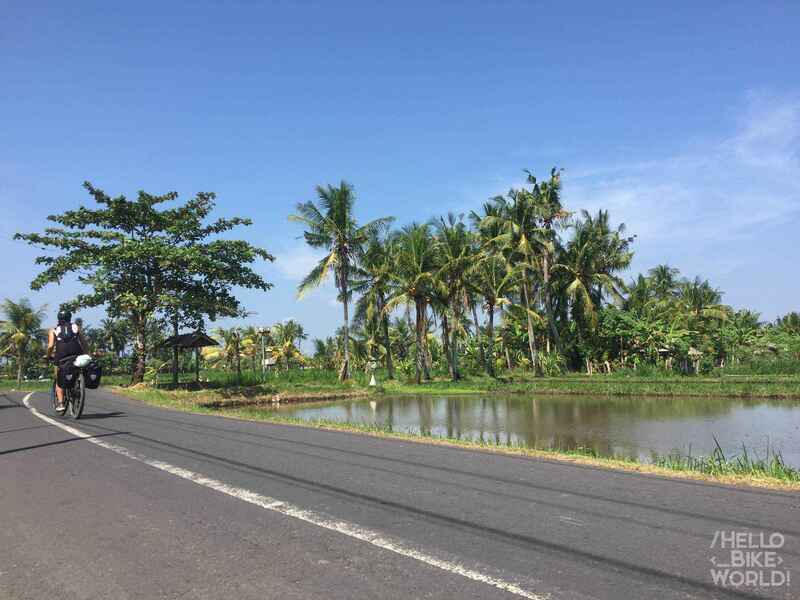 Drive along the East Coast through Sanur and follow the highway – Very fast but not very interesting. See you soon however to Ubud. 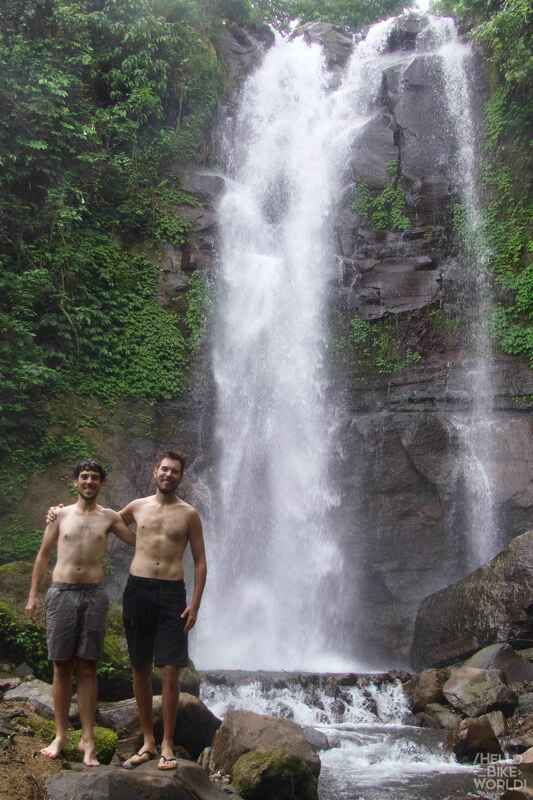 When one follows the further East to Ubud, we go to Falls Tegenungan. 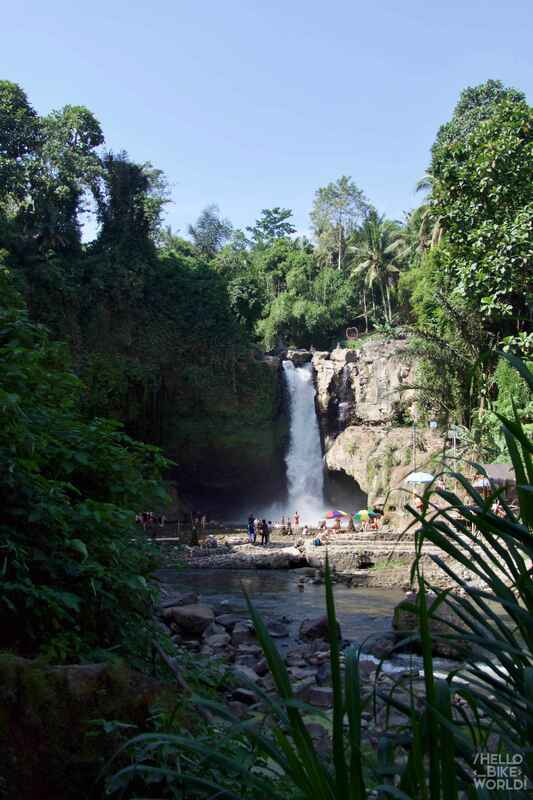 These falls have the feature to be located near a village, and are easily accessible unlike other famous falls Bali. Access is on foot 10 minutes and can swim. After being refreshed in Falls Tegenungan, the road to Ubud is very beautiful and the road is very responsible. When we approach Ubud, however, escape the traffic not… All roads to the city are constantly corked, you just have to take his troubles patiently. And try to stop breathing when we left behind the unfiltered exhaust pipes of cars and scooters. 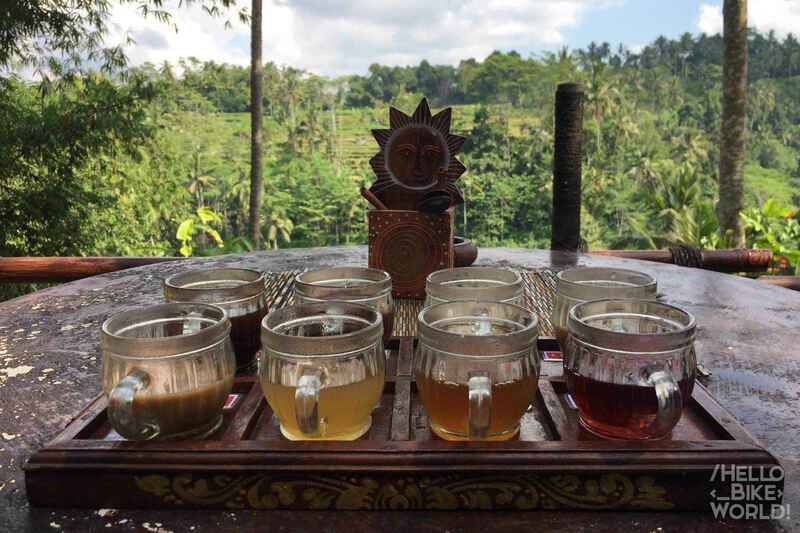 Ubud is really a favorite city, a culinary point of view anyway. There is something for every taste, but especially for vegan, gluten-free, healthy food à gogo. A ride on Tripadvisor will succeed at the game and for the players, a nice little stroll through the downtown streets enough to fall on the pearl. 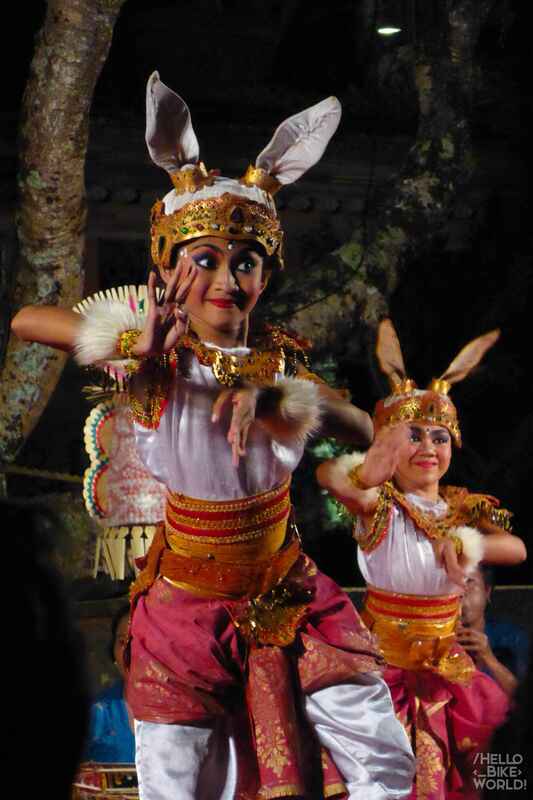 I also recommend the Balinese dance show of the Water Temple (and it only lasts qu'1h, in case you do not enter the trance). Regarding guesthouses, Cheapest Island accommodation found, and there are aplenty ! By bike, this is not much use to book, especially since we do not necessarily get the best price on booking. On the spot, we can see if there is room to accommodate bikes safe (sometimes not obvious in this city for a few narrow streets). After spending several days in Ubud, it's time to hit the road. To the north, is aiming Tegellalang. You can find one or two alternatives but there has only one road that leads right to the North. Good…the place itself is nice but not a sufficient interest to justify stopping several hours. A small photo, time to recharge water and avoid being gently harassed by vendors on the roadside and go again to the North. Finally a nice rise in Indonesia ! I thought the highway designers were interested only climbs over 20% ! Finally a road that does not suffer the chains bikes. Au Nord des Terrasses de Tegelallang, mass tourism has disappeared. There are almost no cars. The climb is almost pleasant (loan default that we should mount…). The view from the top of the pass worth. A small beer in the panoramic restaurant and we go for a much more vertical descent as the rise in the bowl. 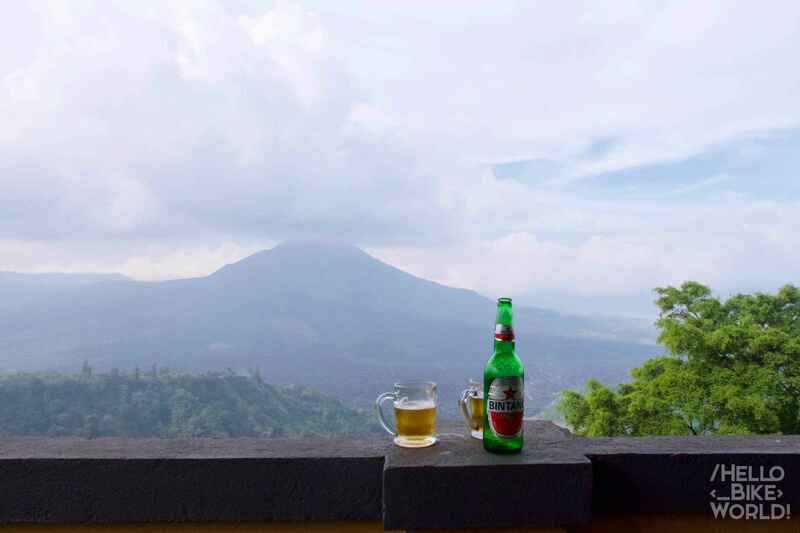 Yes, because in fact, Mt Batur is located in the basin of an ancient volcano. Basically, it is a volcano in a volcano, You follow me ? feet we thought we could climb to the top independently but a local guide told us that it was strictly forbidden to go there without a guide. local mafia or true law ? We will never know, but after some research, those who ventured alone have been blocked by the guides, and sometimes violent… Yet the path looks more that accessible and easy. Not wanting to have a guide in the legs or disbursing 40$ for raising, we abandon the idea. We took refuge in thermal baths where we were able to put the tent for 100kr, after some negotiations with the boss places because normally, it is possible to use the tents there to 250KR. The entry of the bathroom is also paid (150KR per person). In the north of Ubud, after passing the terraces Tegelallang, we leave the motorway at tourists. The roads are as beautiful as difficult, because it is now going to the East, and thus through the ancient lava of Batur languages. The ascents and descents are very steep, and only a small right speed will defeat. Otherwise it will put the foot down. Or force like crazy for people like me, and trike ! The road is again charged more we approach Lovina. 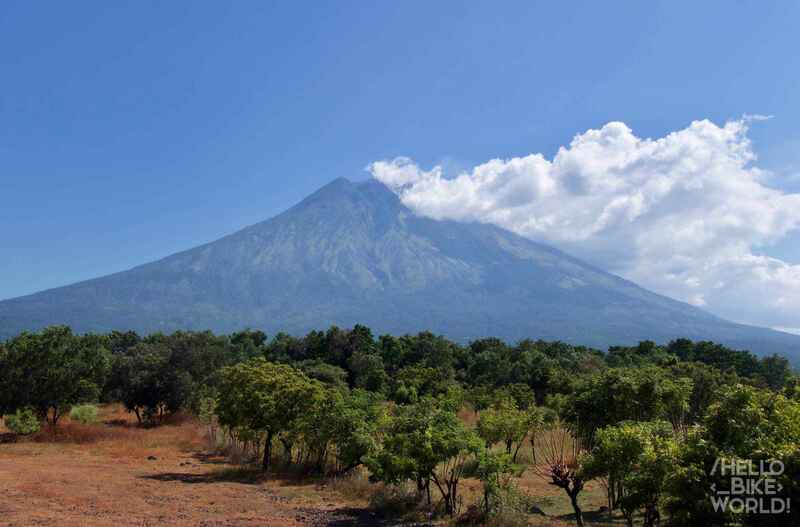 And not very interesting if not stunning views of Mt Agung leaving Amed. I contented myself with the pleasant swimming and loaf at the water's edge. Very good activity after a hard day of cycling in the sun. We stayed away from Lovina to a small beach between Singaraja and Lovina. The Warung Putu offers delectable fish after the catch of the day. The hotels in the area are quite affordable (towards the 11$ for a room). After wading with dolphins (or not), it's time to get a pass. Back to Denpasar, no choice fifteen, we must take the road to Singaraja Betugul. Traffic is strangely very low, I'm not going to complain. The slope is nice bike path opposed to Munduk Waterfalls. Towards the 3/4 neck, one comes across a small parking lot and a path leading to more falls. 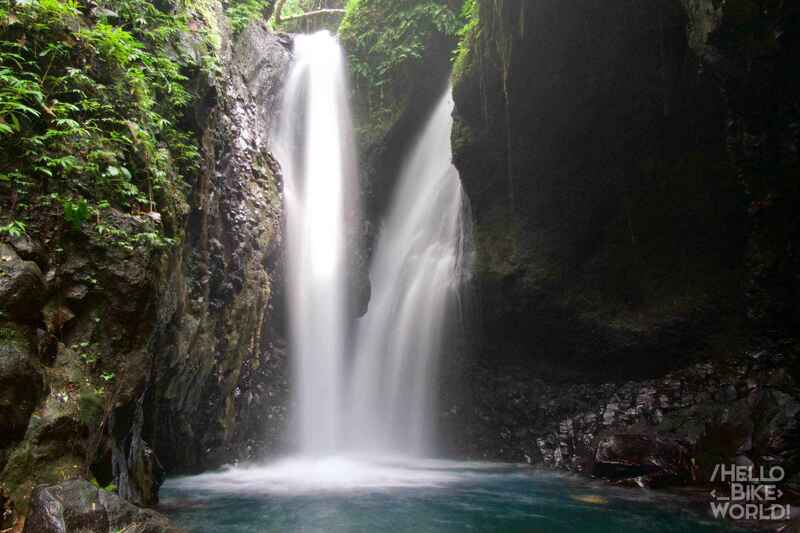 We chose Twin Waterfalls Campuhan. After carefully avoided paying for a useless guide (they did not hurry up to take their services because I had time to buddy-buddy with them), we go down and pay the entry of only 20kr per person. Below, you can swim and enjoy the coolness of the water. Once up the neck, found the road 1/ described above. I let you watch. Ok… since Amed, you have the choice to go to Lovina, or along the most to the East Coast. 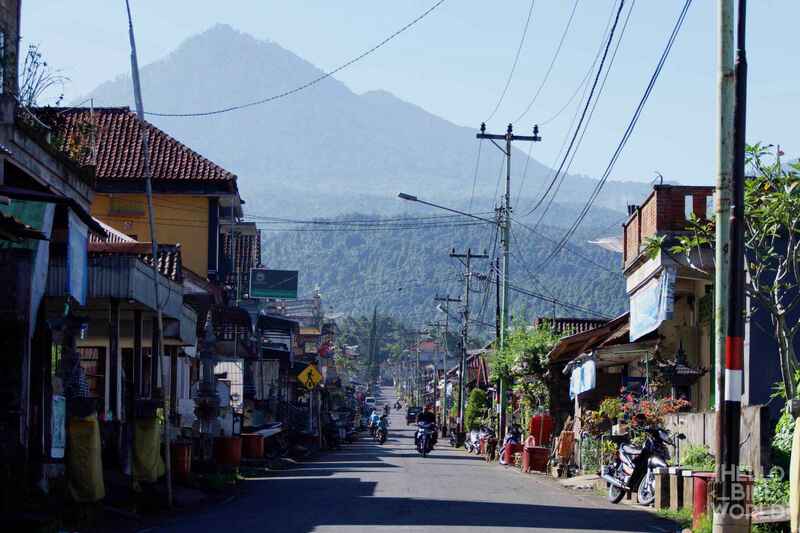 After only 7km, you will get on Lipah, a small village unknown and often mistaken for Amed. Yet it is one of the most beautiful beaches with the opportunity to snorkel from shore ! The masks and fins rental companies abound and prices are not excessive after some negotiations (50KR for both sets). The fins are not even necessary because the corals are really close to the edge. You must love the roller coaster because it is one of the hardest parts of Bali ! Even if the altitude does not exceed 150m. It is only a 30aine kilometers but it takes almost the day to face the. We slept in the parking lot of water palace. I imagine the palace worth (or the cost ? ), parking anyway, is very valuable to ask the tent. 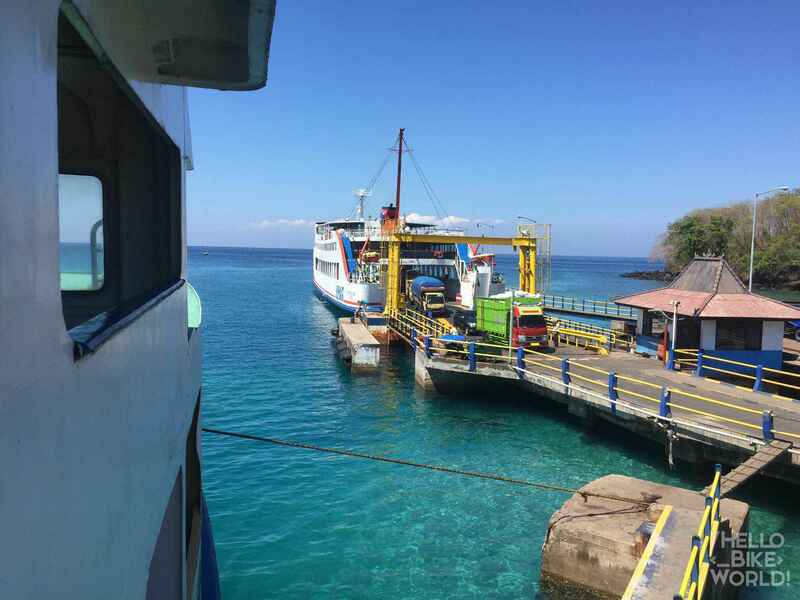 Padang Bai is the ferry terminal which takes guests to Lombok with his favorite vehicle (the bike course). It's much cheaper than the speedboats and it is an experience that we share with local, For better or for worse ! The ferry crossing takes for 5h. But the ferry sometimes takes 5h from as… The hours are pretty decorations that do not seem to have any real meaning. We must rely on the remaining space on the ferry. When overloaded trucks have completed the last remaining centimeter. Up, there is an air conditioned room. Finally…following the ferry to go because only, this was the case. On returning, we had a heartache because of the smell of oil and swell. 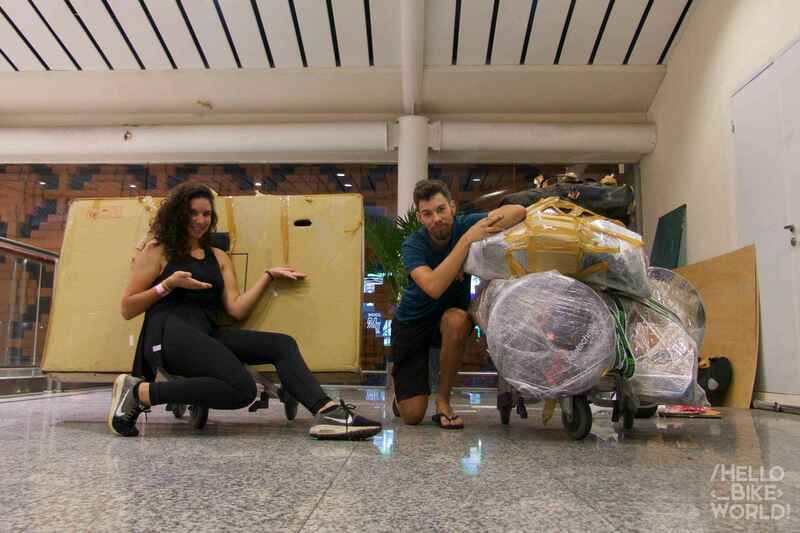 It is better to think about stuff before departure, but it is still possible to buy stuff on the boat from (taking into account the boat tax + Fathead tourist). We arrived very late at Lembar and we have found only one guesthouse : la Tidar Home Stay. It looks like an establishment that has spent his time. Everything is run down and dirty enough. The breakfast is not good and it took the claim 4 time. Do not expect better for 100kr night. We cruised the evening near the terminal, there were plenty of small stalls to eat cheap and well ! Back with the big climbs between Lembar and Kuta Lombok. 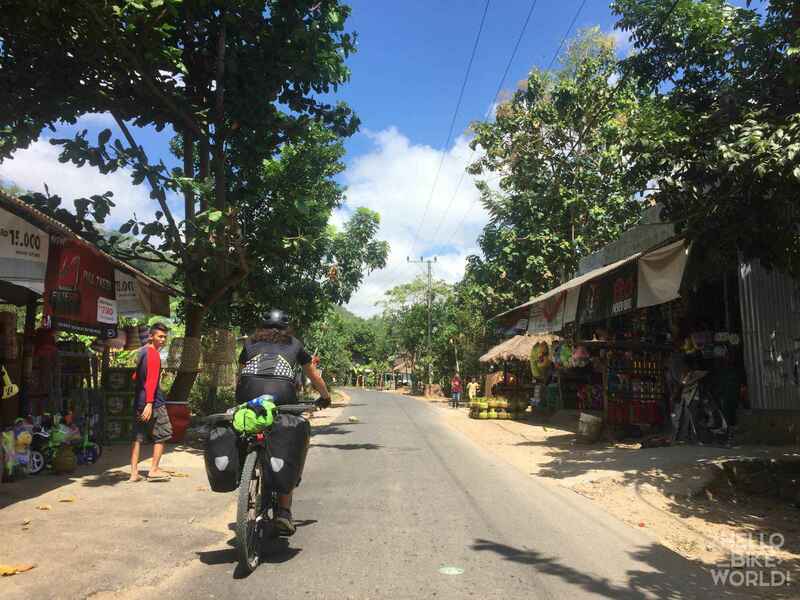 It was of course possible to take a big road but there are several small roads south of Lembar that assess cultural difference between Bali and Lombok. We clearly changed environment and we arrive in villages where there is no or very little ! In the midst of Ramadan, the change has been even more brutal because we did not find any restaurant. À Kuta Lombok, found mass tourism, but with a friendly atmosphere of great seaside town. You can rent a scooter for the day and 40KR along the coast. The most beautiful beach postcard ! Turquoise water, White sand. The road is bumpy, we are glad to have taken the scooter rental for access. Lombok The roads are really nice to ride and there are always several alternatives. Only in approaching Mataram we find a slightly crazy traffic. If you look at the map, you will see that we missed much of Lombok, among others, Part of the volcano to the east. Only through time mark and it was originally planned. 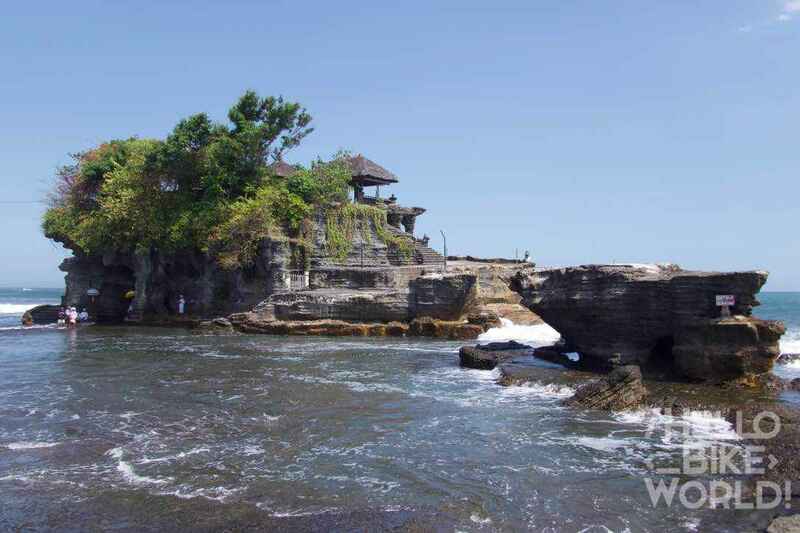 you…the road along the coast is monstrously beautiful but then what about Senggigi ? We still do not understand why there are so many hotels, restaurants (vides) ? one was found nice hotel not too expensive. But not too good vibes in this strange city unlike Kuta Lombok ! 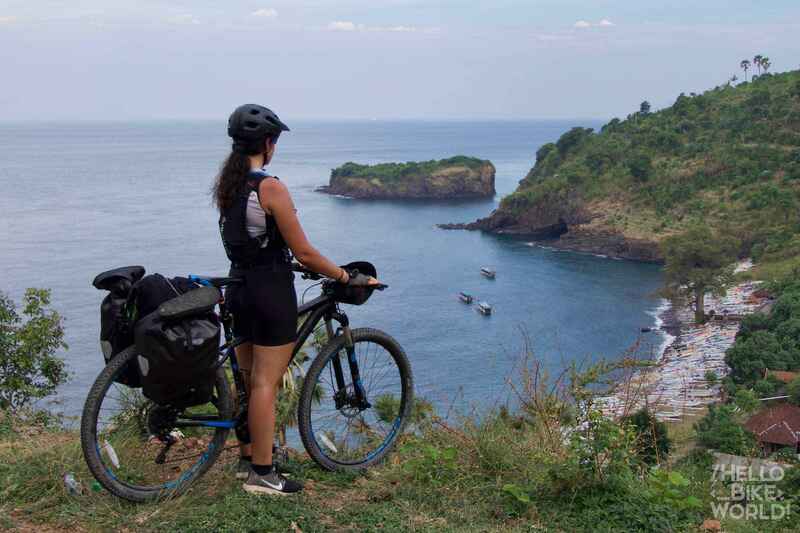 Bali and Lombok are small havens that are absolutely incredible to explore by bike. One can easily find food, water and a hostel to sleep cheaply. so no need to lug a stove and all cooking utensils. The tent can be helpful, but in planning a minimum, you can always swap the tent against a guesthouse. The roads are not always easy with traffic but we always find nice alternative after some less pleasant kilometers. I therefore strongly recommend the islands, even for novice cyclists who are not afraid of a bit chaotic traffic in urban areas. I will never forget this adventure sharing ! A remake, you take an ATV, a trike or Bike trek ?